The age of lumbering was a period of natural development for a fire department. Timber served not only as a natural resource for the development of the lumber industry but also as a natural resource for the disasters of fire. An early lumberman named Matthew Cobb built the first mill on the banks of Pere Marquette Lake. When a fire broke out, it was obvious that there was a need for a fire department. Cobb organized the first local department. Equipment consisted of a few buckets, axes, shovels and a row of wooden barrels filled with water and placed along the roof of the mill. Eight years after the City of Ludington was formed, a fire broke out in the city and consumed 67 buildings including the fire station. As a result of the “big fire”, a water plant and a system of mains to carry water throughout the city was constructed. 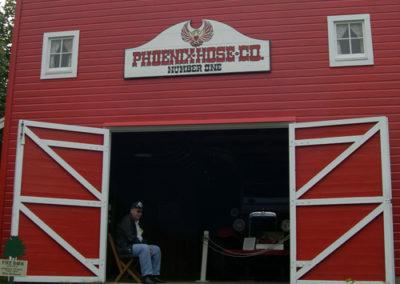 In 1883, a city hall was built which included the first department named the Phoenix Hose Company #1. 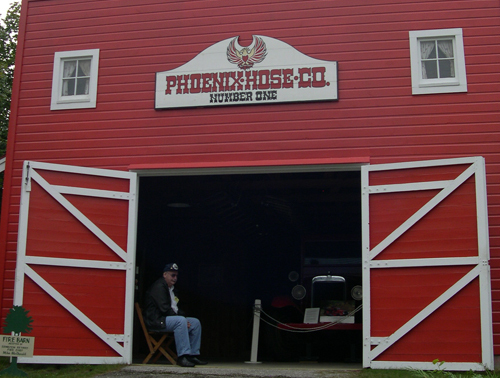 A second division was organized in 1884 in the Fourth Ward, and was named the Phoenix Hose Company #2. Members of each division wore distinctive and colorful uniforms. Mr. Mike McDonald, a member of the Ludington Fire Department, for many years, loans the fire engine on display at the village to us. The fire engine is a 1928 Boyer Fire Apparatus mounted on a Graham Brothers chassis. The engine has been out of service for over 40 years.